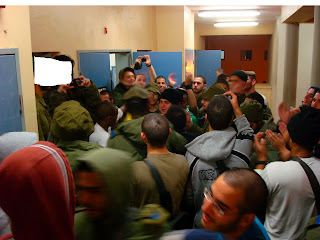 I studied in a Jewish seminary (yeshiva) a few years back, and at the time I was just beginning to consider the idea of serving in the Israeli Army. This particular yeshiva is a "charedi" institution - essentially ultra-orthodox. Charedi yeshivas are generally not very Zionistic, and their opinion of young men serving in an army instead of spending all day every day studying Torah is fairly low. So, when I volunteered to a rabbi that I was interested in the IDF, the response wasn't warm, to say the least. The rhetoric thrown around was that the IDF is a "bad place for religious Jews." They liked to say that it's hard to be religious there, that it's hard to keep your level of faith, and that there are too many bad influences. At the time I didn't have any other information, I didn't know what it's like to be orthodox in the army, so I just took it for what it was worth: hyper-religious Jerusalemites judging what they had no experience in in the first place. I didn't know what to think, but I assumed that they were being slightly dramatic. Easy choice. Shabbat and the holidays, as well, are just kind of thrown in your face. For example, for Shabbat the entire base eats a festive and special meal together on Friday night. In the beginning we say the kiddush, a sanctification of the sabbath day, with the entire base standing with heads covered in the Jewish fashion. We all say amen together, and inevitably hundreds of soldiers are singing and dancing to Jewish songs. There's also a dvar Torah, or a saying from the Torah - similar to a sermon, but usually a highly specific and interesting tidbit on an aspect of a Bible story. In fact, the army is such a good place for religious people that I have actually wondered if the secular soldiers are often uncomfortable or offended. We say prayers together, we have to listen to a religious sermon from a rabbi, there is a large synagogue in the middle of the base, the meals are mandatory, and the commanders made it very clear to not disturb the Shabbat observant crowd - i.e., electronics playing music, excessive use of the lights, etc. I'm constantly surprised at the religiosity of this organization. So when Hanukkah came around I was happily surprised as we were gathered each night to light the candles, say the prayers, and join in on singing and dancing to celebrate the victory that the Maccabeans had over the powerful Greeks. Here we were, a group of Jewish soldiers celebrating the most unlikely of upsets by our Jewish brothers 2000 years before. For so long we had no state, much less no army, and consequently we had no security. Our people were thrown from land to land, abused and led like sheep to the slaughter. But finally we've returned, and I'm a part of that. As we sang "Al HaNisim" I couldn't help but feel the hand of divine assistance; the Maccabean War and the 1948 War of Independence seemed like one and the same. Hanukkah is a celebration of the Jews overcoming the Greek oppressors, a regime that attempted to destroy the Jewish people, faith, and state. We overcame them then, and we will overcome the attackers of our state again. Hanukkah is a celebration of the physical strength to be found in faith, and I think what the charedi yeshivas are missing is that the IDF's fist is steeled only because its other hand is grasping a Torah. We know where our strength comes from, just as Joshua and David knew, just as Judah The Maccabee knew. Here's a video of my platoon dancing and singing part of "Al HaNisim." I wish I had the camera out for the lighting of the candles. Look below the video for a translation of the song. "And for the miracles, and for the salvation, and for the mighty deeds, and for the victories, and for the battles which You performed for our forefathers in those days, at this time. ...When the wicked Greek kingdom rose up against your people Israel to make them forget Your Torah and compel them to stray from the statutes of Your Will, You in Your great mercy stood up for them in the time of their distress. You took up their grievance, judged their claim, and avenged their wrong. 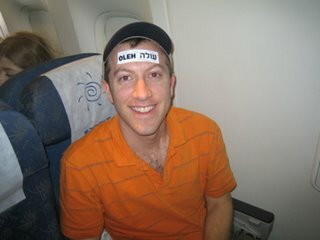 You delivered the strong into the hands of the weak, the man into the hands of the few, the impure into the hands of the pure, the wicked into the hands of the righteous, and the wanton into the hands of the diligent students of Your Torah..."
Did you remove someone's face from that photo? Danny, you are the man. Thanks for protecting us. This is beautiful!! Thanks for posting this and showing me what life is like in the Israeli army. I have heard that it's a terrible place for religious people, so I'm happy to hear different. As an older (secular) American Jew one of the best things I did to boost my religiousness was to volunteer for Sar El. In Sar El I served for a three week pop as a volunteer on an Israeli military base (I did this a few times, but who's counting?). There I witnessed the religousness of the soldiers--and bolstered my own religious observance. Have you met an Sar El volunteers while you were on base? Sarel rocks. I want to go right now. I see Sar El people all the time, usually much older people (like 70s it seems), but I haven't had the chance to talk to them really. I always want to though! Anonymous -- yes I removed a commanders face. Sar El people come in all ages, including lots of 60s and 70s people. One of the things I learned in Sar El is that the Jewish sense of humor is world-wide. Brits and Aussies and South African Jews have exactly the same sarcastic sense of humor as American Jews. I haven't met a lot of Sephardies, so I'm not absolutely certain they have the same sense of humor, but I wouldn't be surprised. In any case, even though lots of the volunteers are in their 60s and 70s they'd all LOVE to chat with real Zahalniks, so chat with them if you have a chance. Don't forget, they could be safe at home on a golf course, but instead they are eating off the same plates as you soldiers because they know there's no better place to be.